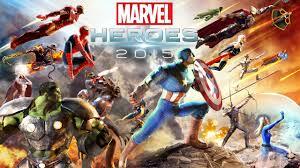 Marvel Heroes 2015 (or previously, Marvel Heroes Online) has just passed it’s first year anniversary. I started playing at release and have jumped back into it on-and-off throughout that year. Marvel Heroes has undergone some massive changes since its release and it’s probably my favourite ARGP; I loved Diablo 3 and Path of Exile but Marvel Heroes just keeps luring me back. Of course this may not be the most balanced description because I could hypothetically be a massive comics / Marvel fanboy. This may have some small grain of truth but I’ll be objective and rational as much as possible. So read on to find out about Marvel Heroes 2015; why it’s totally brilliant and why you should be playing it right now instead of doing other productive things with your life. 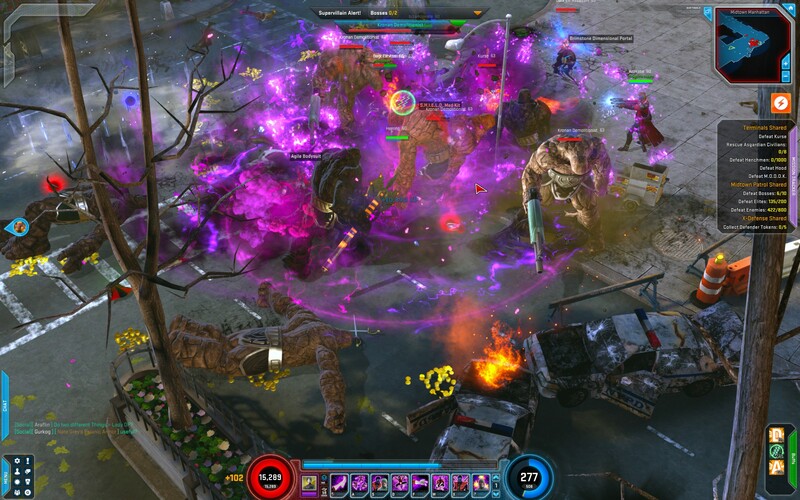 Marvel Heroes 2015 is a Free-To-Play isometric Action RPG in the style of Diablo. Instead of creating a new hero you pick an existing hero from the Marvel universe; adventure as Wolverine, Deadpool, Dr Strange or unleash the full power of Squirrel Girl. Loot gets looted, minions get pummelled and you always look awesome in Lycra. It’s also a huge game and I’ll try and break down all the cool stuff into manageable chunks. Marvel Heroes is at its heart a typical ARPG; you pick a character, grab a few quests and then set about punching / stabbing / shooting / bamfing your way through hundreds of badguys until you get to the boss, who after a brief bit of monologuing, gets punched / stabbed / shot / bamfed to death. What makes MH so good is that it dispenses with namby-pamby realism nonsense and commits 100% to comic-book ludicrousness. Hundreds of minions come at you and the physics engine has been set to ‘Plaid’. Dudes get hurled all over the screen by the force of your attacks and you always feel super-powered. Depending on the stats of your character you can pick up bins, cars or trucks and lob them around while the environment gets trashed by all the combat. This gets even more intense when you realise that most of the game is non-instanced so you get dozens of heroes running about doing their thing. When a boss spawns everyone piles in and it looks like a laser duel in a 1970’s fireworks factory (including the disco mirror-ball). Depending on how you build your character you can have an average of 8-12 abilities, most of which have synergies to create interesting mechanics. I’ve been playing Nightcrawler quite a bit recently, who can set large AoE zones down then rapidly teleport minions into them. Then he can follow up with a “Bamf Bomb” blast, fast teleport punches or wide slices with his swords, depending on his spec. As you may guess, this is centred on the Marvel Universe. If you’re keen on playing Batman, Superman or Judge Dredd you’re likely to be a little disappointed. If you do like the Marvel-verse though you’re in for a treat; Gazillion (the developers) have done a fantastic job integrating the setting to the gameplay. For a start you never get the impression this is just a skin of Diablo with Marvel characters; everything is built from the ground up around the setting. It starts from the character selection screen where you get to pick from a set of famous Marvel heroes. They all have unique skills, gameplay styles and models. 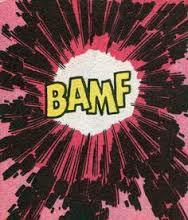 Some of the more outlandish heroes have wildly divergent animations and appearance and they all ‘feel’ right. In the shared areas you can see Mr Fantastic stretching and morphing his way around, Silver Surfer speeding past on his board while ripping holes in the universe with cosmic power, a huge enraged Hulk splitting the ground after every jump, Wolverine on his motorcycle, Cyclops bouncing optic blasts between minions like the world’s largest snooker game. It’s brilliant. And this applies to the villains too; they all look, sound and act right. Bullseye with his trick-shots, Juggernaut with his invulnerability, Dr Octopus with his arms (“Guy named Otto Octavius winds up with eight limbs. What are the odds?”), Hood his with teleport etc. The voice-overs are not skimped on either. Heroes and villains all have unique barks they mention when they see each other. As there are 110 heroes and villains the combinations are just staggering, and again they’re nicely tailored to the hero. Nightcrawler’s range from Catholic dogma through swash-buckling bravado to insecurity about his appearance, all depend on whom he’s talking to. All the optional powers in the skill trees are good fits too. There are variations possible in the builds but all the powers fit thematically. Each hero has a signature and ultimate power which are especially effective and unique. For example, several heroes have teleports and they all function in basically the same way. However Nightcrawler is a character whose central powerset is built around his ability to teleport. 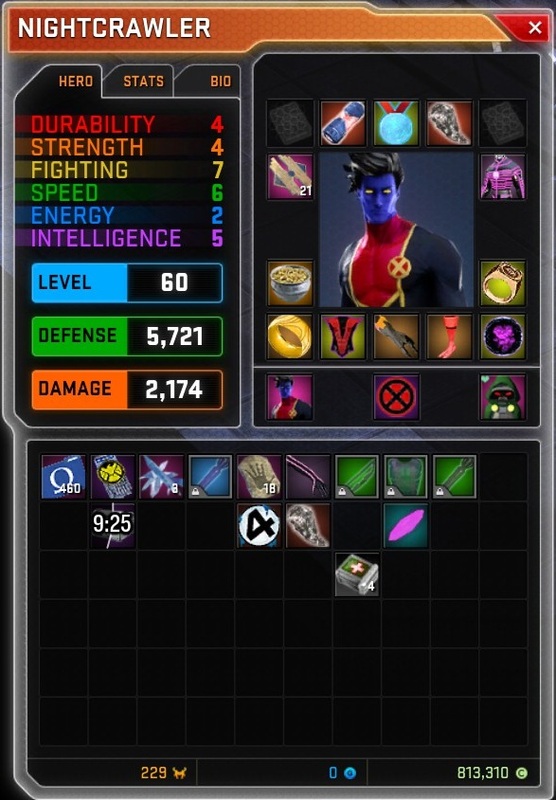 So the teleport for Nightcrawler in the game feels different to everyone elses; there’s no cooldown for one and it’s very cheap so you can bamf around to your hearts content. But on top of that it just feels right; smooth and well integrated into the character’s play. Most of the characters have multiple costumes that change how they look (often the changes aren’t just a re-skin either, like Iron Man with a Hulkbuster costume). Some of them are special costumes that also change the voice-work; many of the Marvel heroes have had different people ‘wearing the cape’ so you can pick your favourite version of Hawkeye for example, including old and female versions. The storyline takes you all over the Marvel universe and when you see all the heroes native settings side-by-side it really strikes you how they are totally diverse in atmosphere. The high-tech prison of The Raft. The pseudo-noir of Dare-Devil’s Hell’s Kitchen. The ghetto’s and oppression of Mutant Town / Strykers crusade from X-Men. The high fantasy of Asgard. There are nine chapters with about 4-6 zones each, which then have instances hanging off them. There’s a pretty decent story (portrayed in an animated, comic-book style) that strings all these together but basically it’s just an excuse to bring all the different story-lines, locations and characters together. Visit Cerebro! Train on the S.H.I.E.L.D helicarrier! Raid Latveria! Explore the Avengers Tower! So you’ve beaten the story and unlocked a new hero. What’s next? Without boosts, finishing the story gets you to about level 30-35 (out of a maximum of 60). There are plenty of ways to get to 60 but the game also rewards players with terminal altitis. Do the Story Again. But this time it’s Really, Really Hard! This is pretty standard ARPG stuff. Finishing the story on Normal unlocks Heroic difficulty. Completing that unlocks Superheroic. It’s fun to try and find some of the optional / secret quests second time around but you don’t really need to (see below) and in many cases you’ll end up doing most of these as part of the other content. You can also jump onto the Terminal system. These are snapshots of sequences from the main plot re-tuned for a quick burst. So you can hop on and fight your way through to Mr Sinister, Dr Doom or The Hood. These automatically scale to your level but also offer three difficulties; Green (a bit harder than normal story mode), Red (a fair challenge) and Cosmic (very hard requiring a tuned character, some skill or both). As well as the XP, loot and a chance to play through your favourite sequences, there are also drops of Cosmic Cube shards, one of the many end-game currencies. Take a partner into the Danger(ish) Room. The Holo-Sim is a multi-round survival game where you have mini-tasks to accomplish within a set time for each round. If you survive / accomplish the task you get a trunk of loot and move on to the next round, which gets a bit harder. The rounds are fairly varied but often involve pummeling large numbers of bad guys. Sometimes that’s all there is to it (ie, survive for a certain time) but other tasks include rescuing civilians from a rampaging Hulk or Pyro, defending Nick Fury or stopping Venom absorbing people. You have two “lives” but these are shared between you and your partner and once they’re all gone you get a final, super-bonus chest (again, scaled to your progress) and then it’s all over. The rounds are short and it gets intense really quickly. If you can coordinate as a team (especially if you can coordinate heroes) you can maximise your performance but it’s certainly possible to get quite far with a pick-up group and decent skills. 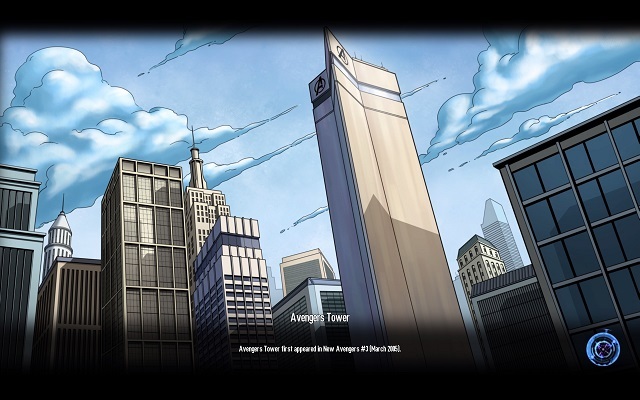 A similar principal to the Holo-Sim above where the idea is to survive waves of enemy attacks on the X-Men’s mansion. 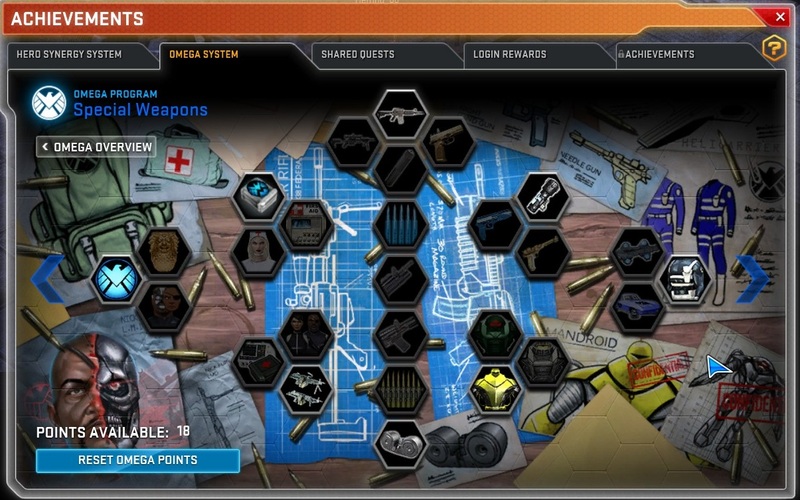 The main differences are that there are more than two players and every round is based on the same idea of defending students from the enemies. Each round is a set of bosses and a constantly spawning wave of minions and only ends when the bosses are defeated. This creates the fundamental strategic tension in the game; do you focus on the bosses and try and beat them down before all the students have been grabbed? Or do you split the team and have some heroes defending the students? Basically a massive, shared area with the monster spawn rates turned up to 11. To spice things up every few minutes a special set of bosses appear at a random location. You get a sense of being in a living city as there are lots of random, incidental occurrences happening (sentinels attacking mutant civilians, robberies, shoot-outs with police, car-jackings etc) as well as large gangs of black-hats fighting the heroes, police and each other. It’s pretty cool to round a corner to see an invasion force of Brood fighting A.I.M scientists while civilians are cowering in fear and the police try to contain the situation. With the wide open spaces, huge spawn rates and large numbers of heroes (all with dozens of spectacular abilities) this is also a good place to see if you can make your graphics card / physics card burst into flames. Quite a recent addition and one I’ve not tried. But the storyline ends on a cliff-hanger and this allows you to fight the new bad guy mentioned. It’s apparently fairly standard 10-man raiding stuff (somewhere between World of Warcraft “Looking for Raid” and “Normal” difficulties) but only takes an hour or two to complete. As with the Terminals the difficulty is colour-coded. 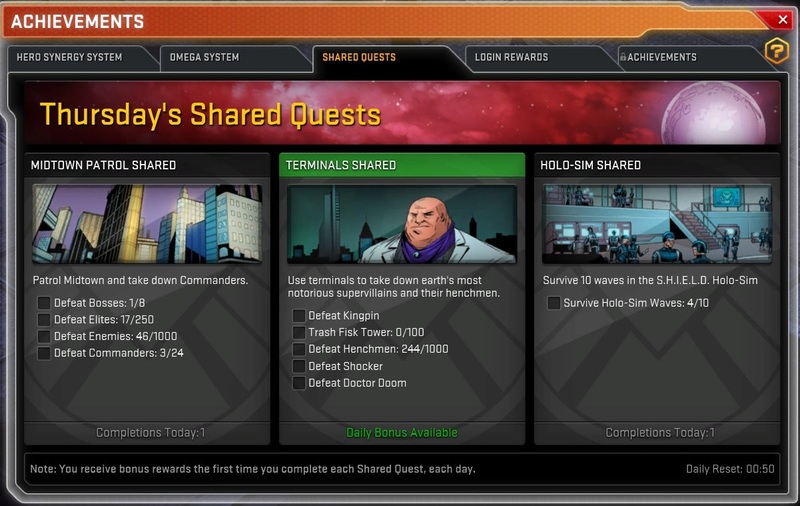 Your character will have three Shared Quests and a Legendary Quest at any one time. These will take you to one of the above areas and give you something to do. Completing them gives you some additional rewards on top of the standard loot from the area (often currency, see below). 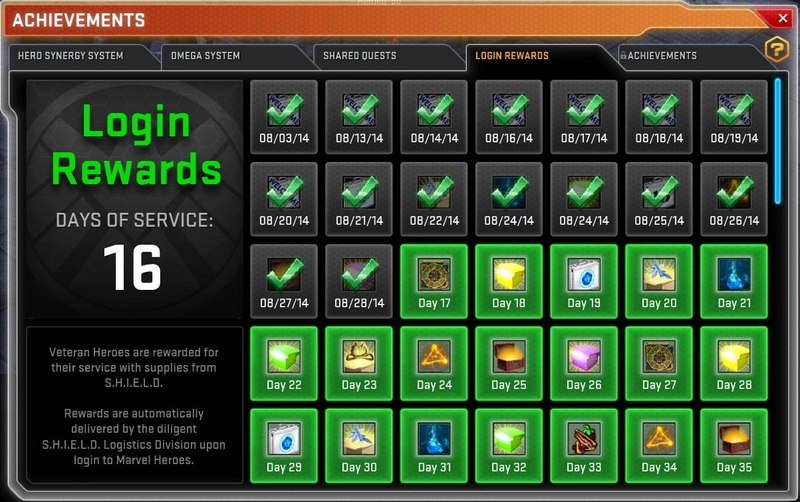 Marvel Heroes has a rotation of regular events lasting a week. During these events special currency or loot may drop and there’s usually an XP and/or item-find bonus applied to special areas in the game. There is no other way to describe the loot; there is tonnes of it. 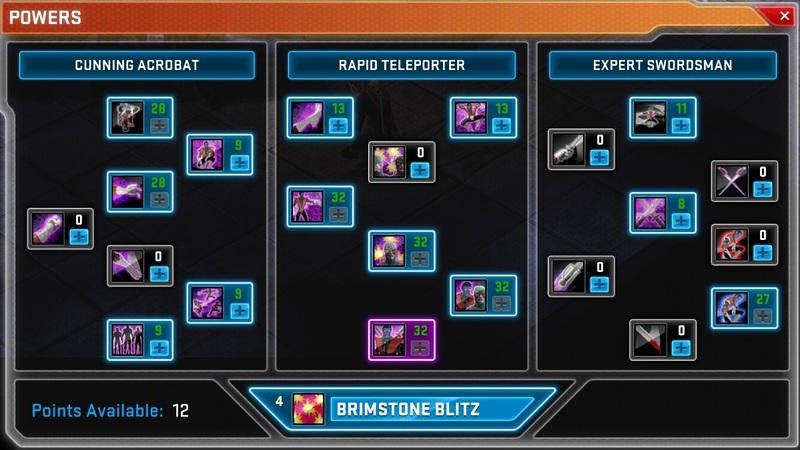 Artifacts, Item Slots, Legendaries, Medallions, Relics, Pets, Costumes, Blessings, Rings, Insignias, Uru-Forged Items and Runes are all useable to buff your hero and each of them have a unique location on your inventory. Your five item, ring and insignia slots can all contain items that scale through grey (rubbish), green, blue, purple (epic), cosmic and unique. And within each ‘class’ there are random affixes and stats so you’re always looking for a replacement item with better stats. The Uniques and items can also be tailored for specific builds and skills for your hero so there is always something else around the corner. Relics are particularly interesting. There are dozens of types and they drop fairly frequently. You have a single relic slot (shown to the left of Nightcrawler’s head in the picture) and the larger the stack of a single relic the better the effect. For example, I went for the Relic of Lemuria which gives health and life-on-hit. The items can boost your skills, your base stats (strength, fighting etc), your secondary stats (critical strike, damage rating etc) or create unique effects (like summoning a demon to fight for you, creating invulnerability orbs or loads of other cool stuff). On top of that there are lots of cosmetic and game-changing ‘enchants’ that can go onto each slot including five effects on your costume alone. There’s always something cool either dropping or tempting you to play more. Interestingly I don’t seem to get blasé about loot like I have in some other games where going through it becomes something of a chore. One of the the changes about to happen is leveling your pets (“Cybernetics”). You can set your pet to hoover up loot automatically according to certain thresholds. As well as character progression all your vendors have progression too. It’s quite simple – you donate unwanted items to them – but it’s also pretty necessary and the advanced recipes for crafting only become available once they’ve hit certain key levels. These are vital to get best-in-slot gear and enchants for your hero. Best practice seems to be leveling your crafter first (to twenty, the max level) before starting work on your enchanter. Luckily these are available to your entire account so all your heroes benefit. Credits. Your basic ‘money’. Used for all sorts of basic stuff (like buying medkits), it’s generally used in some form for all the purchases you’re going to make. Gazillions. What you get if you spend real money. You can use these to get new heroes, more costumes, boosts for your characters, and more stash space (tabs on your bank). As far as I’m aware, the latter is not available through other means. Eternity Shards. The main free-to-play enticement. You get a random amount of these (depending on luck and your stats for finding special items) and you can use these in place of Gazillions. They have a lower-threshold attached so you’re always guaranteed to get them at a minimum rate of 1 every 8 minutes. As well as spending them to purchase specific heroes you can also spend a lot less to get random hero. Runes. Used for all sorts of advanced crafting. Interestingly, the drop chances change on some runes depending on where you are or what day of the week it is. Crafting Components. Four main types which scale up through multiple sizes. If you have leveled your crafter high enough you can merge and split them for a small credit cost. Blessings. Basically enchantments for your loot. These also appear to be the main currency for inter-player trade. Event drops. Many of the regular events have a set of collectable currency that can be exchanged for cool stuff. Cube Shards. Mostly available from Terminals. Can be used for boosts, recipes, pets and Fortune Cards. Fortune Cards. These drop rarely or can be bought with G or Cube Shards. When opened they give a random item. Most often it’s a boost potion, but if you’re lucky it can be a costume or some other currency. Odin Marks. The main currency used to apply runes and enchantments. Sentinel Parts. Make mini-sentinels our of arms, heads and torsos! I have no idea what these do! Whenever you earn XP by playing your character you also acquire points on your Omega bar. 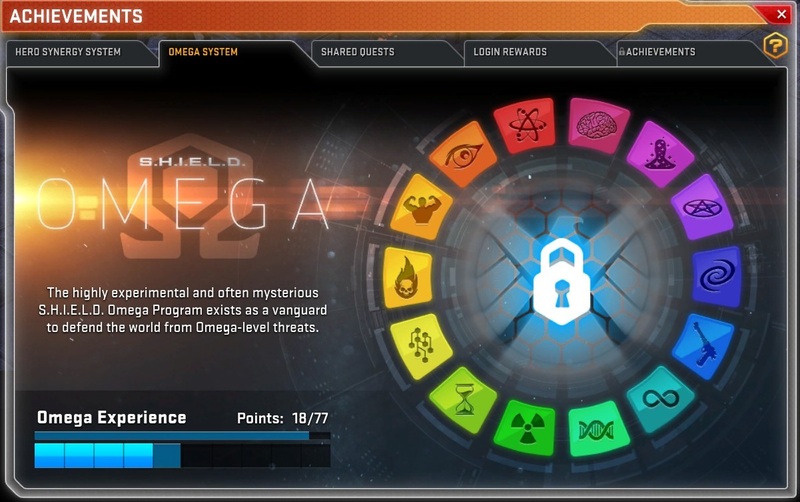 When you level up you get an Omega point (you can also get these as loot). They can then be spent on additional talents (all passive) from a large wheel of types. Each hex requires a certain number of points to unlock and most have more than one level. The cost for subsequent levels increases each time and some of the deeper nodes will require hundreds of points to even get to, no matter about max. The Synergy System : Or How to Cater to People with Commitment Problems. 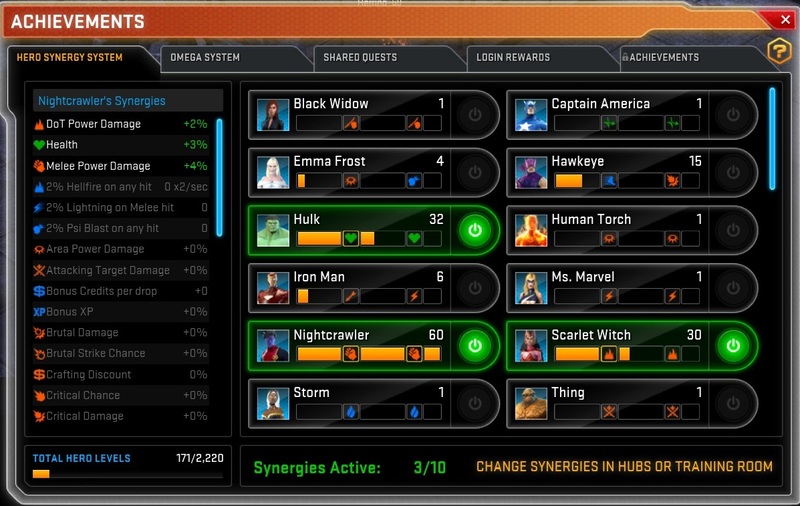 Marvel Heroes makes playing on multiple characters really easy. Your vendor’s level is shared over your account; your currency and stash are shared; you can share uniques and unbind them from a character using your crafter etc. The Synergy System actually rewards you for having multiple characters. Each has a special Synergy bonus that unlocks at levels 30 and 50. Each character has 10 personal Synergy slots they can use to apply a Synergy bonus. So Scarlet Witch’s level 30 Synergy bonus is a +2% bonus to damage over time effects, increasing to 4% at level 50. Once she’s level 50 I can login with Nightcrawler and use one of my Synergy slots to get that bonus. Obviously some Synergy bonuses are better for some characters than others (and some are just generally awesome; Cyclops gives a bonus to XP gain and Deadpool gives a bonus to item find) so you’ll want to pick and choose. But it’s still great if you like rotating characters. 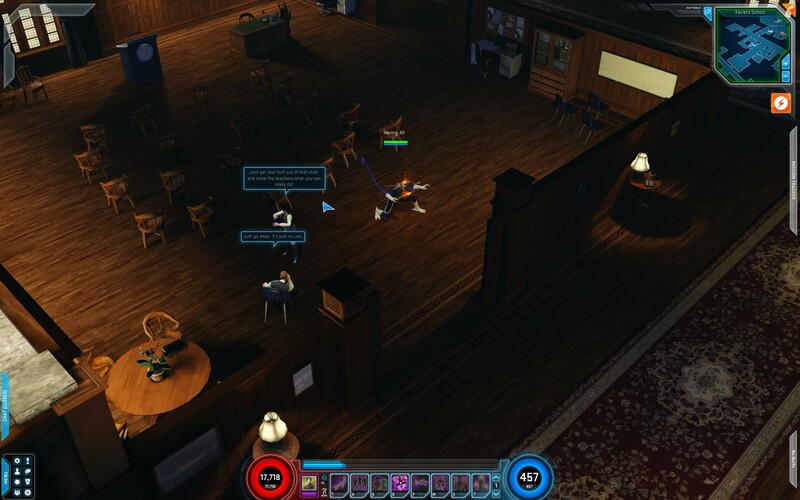 Marvel Heroes is a brilliant game. There’s always something to do, it doesn’t require a massive time commitment, it rewards multiple play-styles and it’s a massive enabler for Marvel comic-addicts. It’s also full of gleeful destruction, allowing you to jump into the middle of dozens of robots, dinosaurs and dinosaur-robots (yes, really) and just SMASH. Next Next post: What is Recursion?